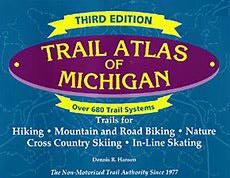 The 3rd Edition of the Trail Atlas of Michigan is totally revised for 2002 — the first revision since 1997. The Trail Atlas of Michigan is the only comprehensive guide of non-motorized trails for Michigan. The Atlas covers hiking, x-c skiing, mountain and road biking, in-line skating and nature trails. Over 680 trail systems, 789 pgs, 11 ” x 8.5″ & 4.5 lbs!. The Atlas covers trails in every corner of the state from Monroe County near Lake Erie to Keweenaw County in the Upper Peninsula and hundreds of places in between. Every possible trail is included. From 1/2 mile to hundreds of miles long. City, county, regional, state and federal parks and forests are included. Huron-Manistee National Forest, Hiawatha National Forest, Ottawa National Forest, Pictured Rocks National Lakeshore, Sleeping Bear Dunes National Lakeshore, Isle Royale National Park, all State Parks and State Forest Pathways are in the Atlas. It also includes the trails in the Huron-Clinton Metropolitan Authority regional park system and rail-trails. Also included are linking type trail systems including the Paint Creek Trail, Midland-Mackinac Trail, Huron Valley Trail, North County National Recreation Trail and the Multi-Jurisdictional Trail to name only a few.